Expert Advice: What Does a Swim Spa Look Like? Posted on August 25, 2017 , in Swim Spas. Everyone knows what a swimming pool looks like, but when it comes to swim spas, many people are less familiar. Swim spas come in a variety of shapes and designs, so they can look quite different. Below you’ll find examples of a variety of different types of swim spas and get knowledgeable recommendations so you know which one is best for your space. Swim spas are small pools, and typically look very similar to pools. They are typically 4 to 5 feet deep and can range from 10 feet to 21 feet in length. Similarly to swimming pools, swim spas can be installed in-ground or above-ground and may be located within a deck or patio, placed upon a lawn, or added to an indoor solarium. 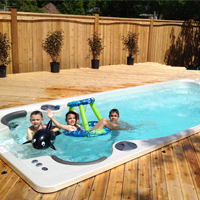 There are also split design swim spas which feature both a swim spa and a hot tub. There are two types of in-ground swim spas: acrylic and vinyl. In-ground acrylic swim spas look similar to a very small pool but they are made of acrylic, so their shell looks more like a hot tub. The interior components including the heater, pump, and filter, can be placed anywhere, just as they can with a pool. Acrylic in-ground pools can be installed within a deck, landscape, solarium, or elsewhere. In-ground vinyl swim spas look similar to in-ground pools, except that they are of course smaller. They feature swim jets you can adjust so you can swim against the current so you can swim continuously rather than turning or stopping on the wall. When you want a swim spa that is easy to install and easy to move, a portable swim spa is a great choice. In addition to free-standing portable swim spas, a portable swim spa can be placed within a deck or other location of your choice. Depending on which manufacturer and contractor you work with, you’ll have a huge range of options when it comes to the style and shape of the swim spa as well as the area where you locate it. Whether you want a simple look or a more elaborate design, you can work with your contractor to make sure the swim spa area fits your personality. Working with landscapers, investing in patio furniture, and creating complete outdoor areas can also help you create a perfect location. Now that you know what a swim spa looks like, download our buyer’s guide to find the ideal swim spa for your space.